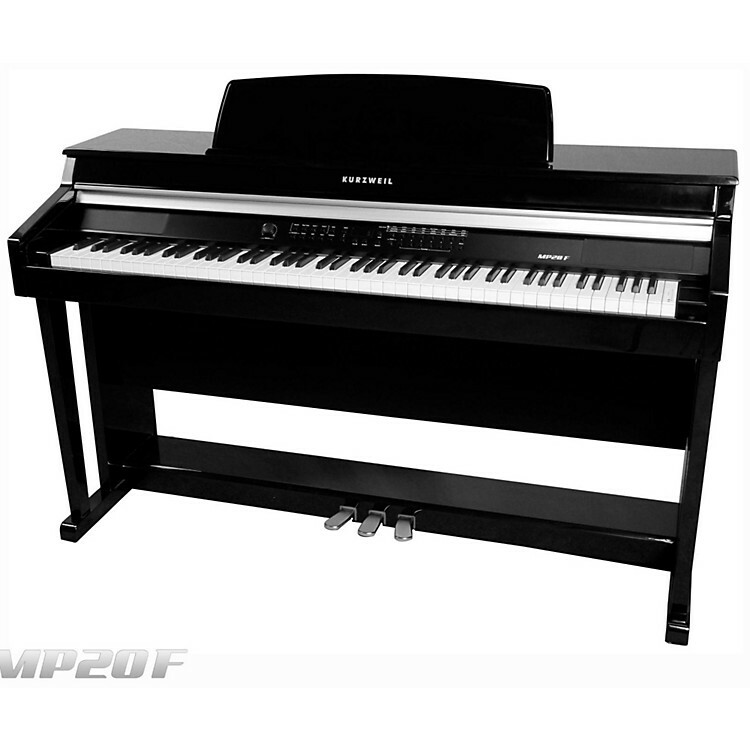 Home piano with professional sound and control features. The MP20 digital piano combines value and affordability with 200 of the best sounds ever developed for KURZWEIL professional keyboards and control features engineered for convenience and utility. Fusing traditional spinet piano design and styling, the MP20 is available in two finishes: a fine Ebony Polish with an elegant look for more formal settings or the Satin Rosewood for any room. The uniquely angled, tuned, ported-woofer enclosure provides deep bass and heightened sound dispersion to complement the instrument's broad sound set. With tweeters placed directly behind the keys, a wide stereo sound field is created, optimized for both player and audience. The MP20's simple and intuitive control panel is angled for improved visibility/use and features an easy-slide key cover. The MP20 sonic pallet features the famous KURZWEIL Triple Strike Grand Piano along with a diverse array of top notch and categorized instrument selections including electric pianos, organs, orchestral, drums, basses, horns, winds, guitars, percussion and more. The MP20's easy Split and Layering features offer yet another dimension of performance while its "Favorite" buttons provide instant recall of your most needed presets and custom combinations. Great piano control starts with the keyboard action and the MP20 has one of KURZWEIL's best proprietary hammer-action keyboards. Hammer motion, not key motion, is sensed to provide the most accurate dynamic control possible. The new MP20 keyboard grades the hammer weight through four gradual zones from light in the treble end to heavy in the bass end. The action also features an escapement that reproduces the let-off and jack engagement feel of a real acoustic piano. Complementing the key-action, the MP20 features all 3 standard acoustic piano pedals built-in (sustain, sostenuto and soft) along with a Volume/Expression pedal input, which facilitates dynamic performances. Superior sound and styling. Order today.